So, in order to store your seasonal gear, are you planning to build a shed or small garage in your backyard? We have a pretty good idea that what one of your main considerations is – the door. Instead of using two 30‑inch wood doors, there are many reasons to use one overhead door. 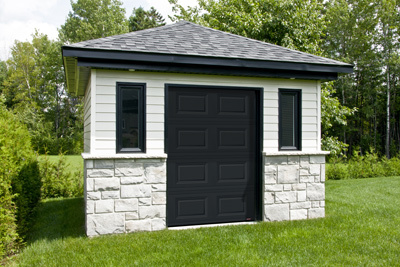 Coordinate the garage door of your shed (6’ x 7’) with that of your main garage door (9’ x 8’). First, a sectional door is… very practical! A sectional door opens toward the interior of the shed, instead of toward the outside like a tilt garage door/swing garage door. This means in the winter, you won’t have to shovel the show in front of the door to access it. A sectional door retracts toward the ceiling, meaning you maximize the interior space you need. With a six-foot wide door, it is easier to move large equipment around. Larger than a 36-in veneer door, you can easily move in and out your motorcycle, ATV or snowmobile. You can finally install an electric garage door opener. With a simple click, you are able to easily open your garage door without getting off your motorcycle. 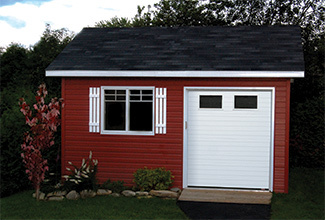 You can match the color and design of your shed garage door with your main garage door. If you add windows, you can get the same model for both doors. Contrary to 36-in veneer doors, you don’t have to paint them. They come with a baked-on paint finish in a variety of colors. Most shed doors are at least 6 feet wide and 6' 6" high, especially if you want to store a motorcycle or ATV. You can get a garage door as small as 4-feet wide, and even install a window. What are the possible choices? A non-insulated door like the Uniforce (2" thick). An R‑10, polystyrene-insulated door like the Triforce (2"). An R‑12, polyurethane-insulated door from the Acadia 138 series (1 3⁄8"). An R‑16, polyurethane-insulated door from the Standard+ series (1 ¾").